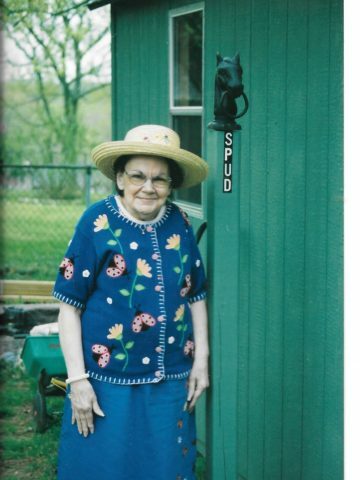 Lottie C. Smith, 82, passed away with family by her side, Friday September 14, 2018. Born November 5, 1935 in Oneida, TN, she was the daughter of the late Glenn Edison Caylor and Lottie (Waters) Caylor. Lottie was also preceded in death by her husband, William “Spud” Smith; a brother, Roscoe Smith; and her daughter-in-law, Rhonda Smith. Lottie’s mother died during childbirth leaving Lottie to be raised by her aunt. She was a devout Catholic and parishioner of St. Joseph’s Church. She had worked in early childhood education as a member of the St. Joseph’s Daycare staff as well as for other day cares. She loved anything to do with being around and educating children. Needless to say her family was very near and dear to her heart. She also enjoyed knitting and crocheting, reading, gardening and baking. For many years she kept a journal. She is survived by her daughter, Michelle “Missy” Patterson and her husband Kevin; two sons, Lynn Smith and his wife Kathy, and Jamie Smith; 7 grandchildren and 2 great-grandchildren. A Celebration of Life Service will be held Tuesday at 11 AM at Cole & Garrett Funeral Home, Goodlettsville. Visitation will be from 9 – 11 AM Tuesday; a reception for family and friends at the funeral home will be held following the service. Much love an prayers going out to the family ! Holding you in my heart and prayers at this sad time. Love to all. My thoughts and prayers go out to you all. I am just sorry we had lost touch over the years, but please know that you all were ever in our hearts. Please accept my heartfelt condolences. We look forward to the time when sickness and death will be things of the past and to seeing our dead loved ones restored to life here on earth under much better conditions. (Isaiah 33:24; Acts 24:15; Revelation 21:3-4) Until that time may your memories, prayer, and the loving support from your family and friends help you through this very difficult time.